Meticulous workmanship with great effort made to leave the site clean and tidy. Good knowledge and recommendations given for aftercare. Work on oak trees subject of TPO's and application for planning permission. Friendly, polite, professional handled everything including applying for planning permission which was a great help. I would recommend this company. Large conifer hedge cut lower and single conifer shaped. Polite, friendly and did a very good neat job. Have used this company before and recommended to others. Large conifers cut and tidied and one large conifer tree cut back. Very professional and knowledgeable! Friendly nice people and very tidy. Thoroughly recommended. Topping leylandi, removing dead branches from large oak. We have used "Special Branch" for a number of years and always get good service. He and his partner did an excellent job. Excellent service. Special Branch Tree Services submitted permission to council. A complete service. Reduction of ten fir trees by 10m from 18m on the boundary fence. Very professional and competent company who executed work to an excellent standard. All staff were competent and respectful. Best service received from any tree service company. Would recommend special to everyone. Excellent - on time and clear up well. Efficient in quotes of work. Cutting back conifers and hedges. Excellent service as always. Very happy to recommend this company. Taking out of eucalyptus tree. Very polite, excellent service. Very good value for money. Would use again. Removal of one tree, pollard of one tree. The jobs were completed whilst I was at work. I came home to a neat and tidy garden, side path and front drive. All the waste materials were removed plus the branches and stump were all cut cleanly. I have used this firm for several years and been very satisfied with the work undertaken. Removal of overgrown Magnolia and thinning / Crown Lift to Liquidambar tree. Excellent workmanship everything left clean and tidy. Will probably need their services again in a couple of years when the Liquidambar has regrow. Guess who we'll be calling !!! Always leaves place spotless after work. Very good. Second time they have done work for us. Coppice overgrown plum cherry tree. Excellent work on a tree as high as the house! Attention to detail despite high winds and heavy rain. Reduction, pruning and shaping of large conifer. Really professional, very polite, made a difficult job look easy, tree looks very good. Removal of 2 conifers and 1 leylandi. All work carried out as described in a professional manner and a smile! Reduce tree crown remove confiers. Excellent, neat and tidy, punctual and friendly, would use again. I would recommend this company. Cut 4m off 2 fir trees and reshape. The job was undertaken in an efficient manner and the outcome was exactly what we wanted. Tree pruning, cutting back interals. Good service, very friendly, returned phone calls and good quality work. Robinia was crown reduced and reshaped leaving the tree a wonderful shape, neighbours have commented on a wonderful job! Satisfactory as always. I would recommend this company. Excellent service, prompt arrival, very tidy work. Removal of large tree from enclosed front garden. Due to it’s location, the tree had to be removed piece by piece. The team were friendly and professional from providing the quote through to tidying up after the work had been completed. We would recommend Special Branch Tree Services without hesitation. This work was carried out very professionally,on the alloted day and at the agreed price. We are very pleased with their workmanship and will certainly be using them next time tree work is required. Efficient, courteous, prompt and tidy. Very good, completed work with good advice. Removal of a large Eucalyptus tree from garden. Excellent service. Competitive price. Tidy and professional. Would definitely use them again and recommend to others. Removing 1 tree and tidying and trimming another. Jim is very pleasant and gives an excellent service. Everything was left very clean and tidy. Fantastic job, very professional and courteous. Very knowledgable and clearly care about trees. Reducing internal branch of oak tree. Work well done and efficiently. Well equipped, cleared all the rot wood. Have used this firm several times and have been well satisfied with the service provided. I would recommend this company. Use on a regular basis for tree work. Wouldn't use anyone else, helpful, knowledgeable and honest. Confier hedge loping and trimming. Excellent service, work carried out when required no mess remained, excellent price. I would recommend this company. Felling 13 trees at the hotel. 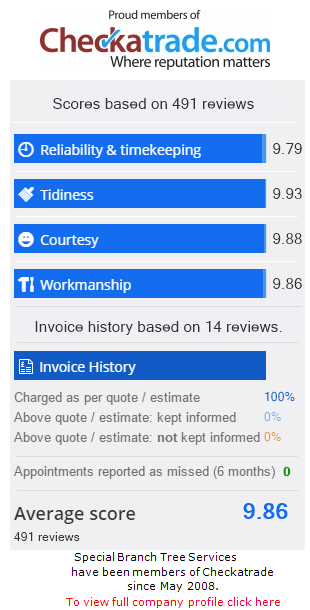 Great job, I would recommend this company. Mixed tree and shrub cutting pruning. Excellent work, very considerate, already booked for the next job, we have recommended to our friends. Oak tree pruned and other tree felled. A very efficient but friendly service. Excellent quality of work. A company I would definitely use again. Excellent job done, very tidy. 4 fruit trees pruned and reshaped. Plastered apple tree reduce layer of Leyland. Very capable respectful of plants and garden excellent work and cleaned up very well. Did extra job for me, no charge. I would recommend this company. Very competent in what he was doing. Would not hesitate to have them again. This the second time I have used this tradesman. With excellent results. Emergency tree works to remove dangerous limb. I cannot rate this company highly enough. Put quite simply, they do the job properly from start to finish. Excellent service Tree was pruned very expertly and the site was left clear. Jim and his team did an excellent job and we are really pleased with the result. They are a professional, well run operation and one that I would certainly recommend. An excellent service, polite and trustworthy. They came on time and did a good, efficient job. Very pleased with the standard of work. The tree is now a lovely shape and within the guidelines laid down by the council. Jim was very helpful with advice and options from the beginning. Both Jim and Neil were cheery and hard working. Have already recommended them to a friend. Reducing crown of 2 trees felling two others. The Work was carried out in an exemplary way and all the cuttings and sawdust were cleaned away. I have no criticism of their work, and the advice that I was given originally was proved correct. Very professional. Always leave the garden tidier than when they arrive. Pruning of trees and shrubs in back garden. Excellent service. Quick quote, kept me full informed, very good job done.